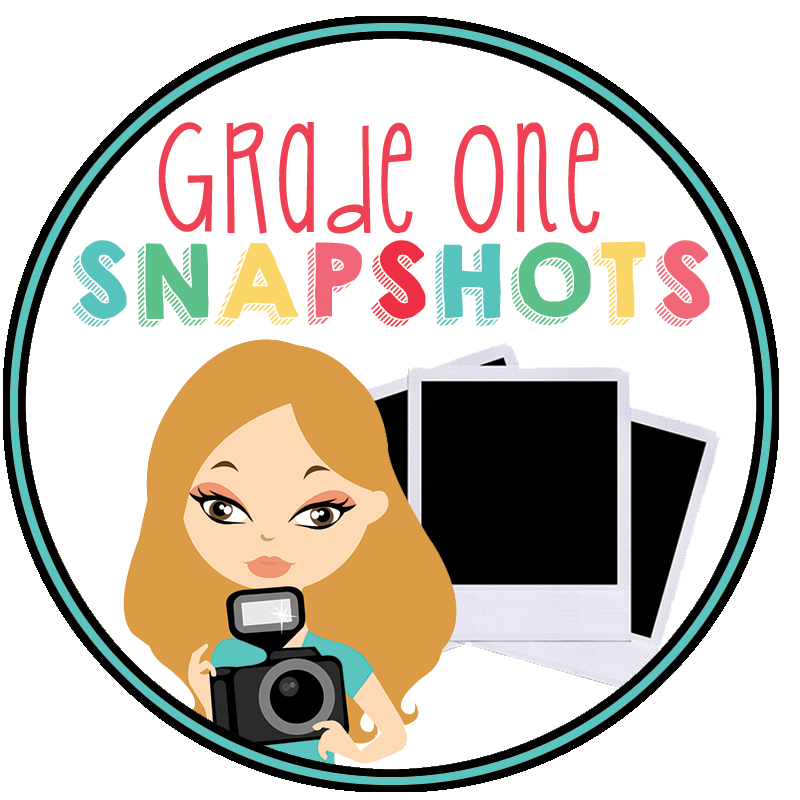 I am so fortunate to be able to write about a fantastic product from my blogger-friend Bonnie Kathryn from Kinders and Beyond! 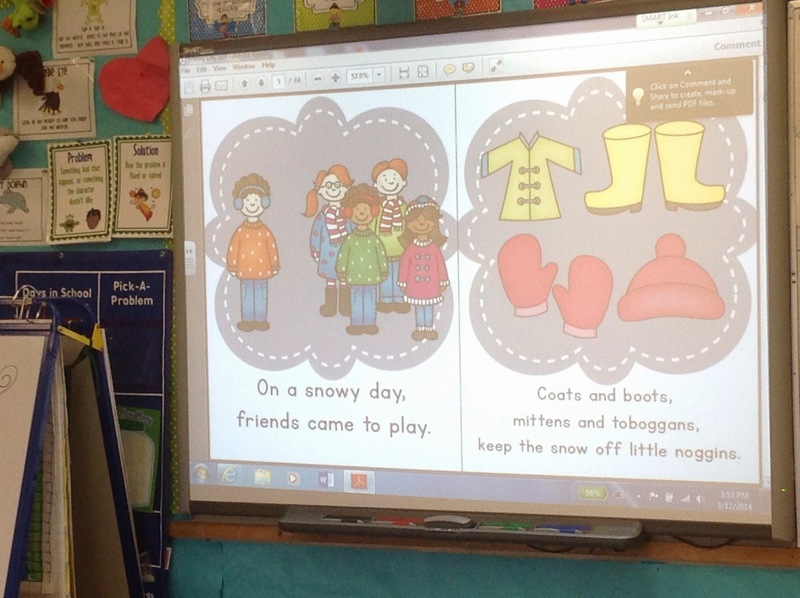 She shared her "Snow Much Fun" Winter Emergent Readers with me. 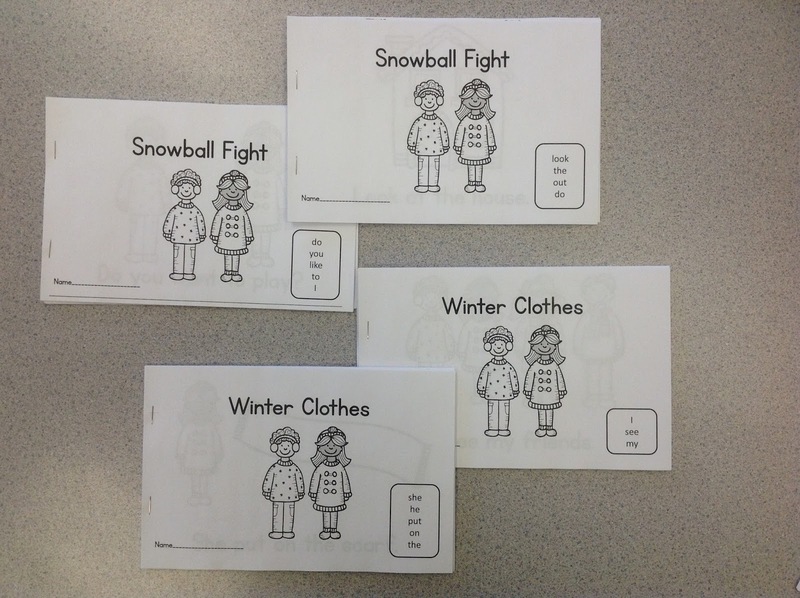 It is a fantastic pack for teaching sight words and thematic words for winter. I will share how I used some of the materials in my classroom! 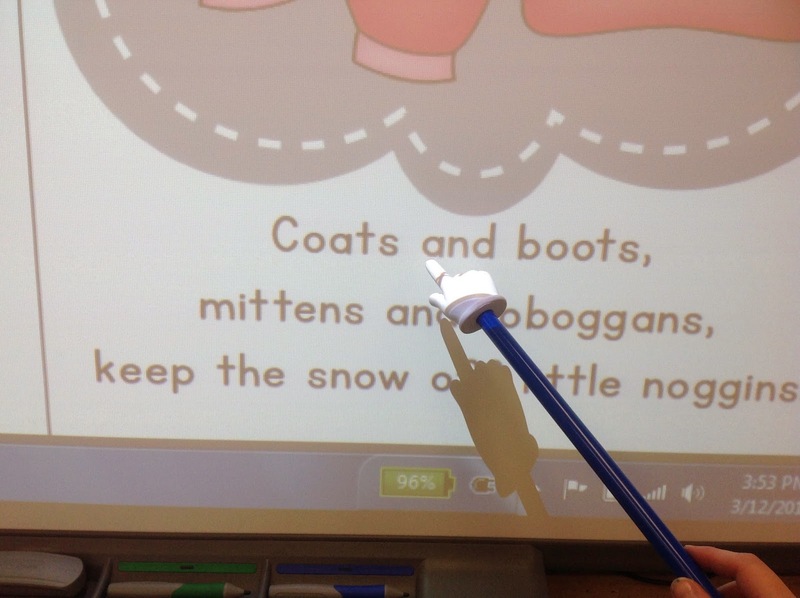 I have a projector/smartboard in my classroom, which is a fun way to do shared reading. Here I have it projecting two pages of the class reader. I like to give students turns to use a pointer. 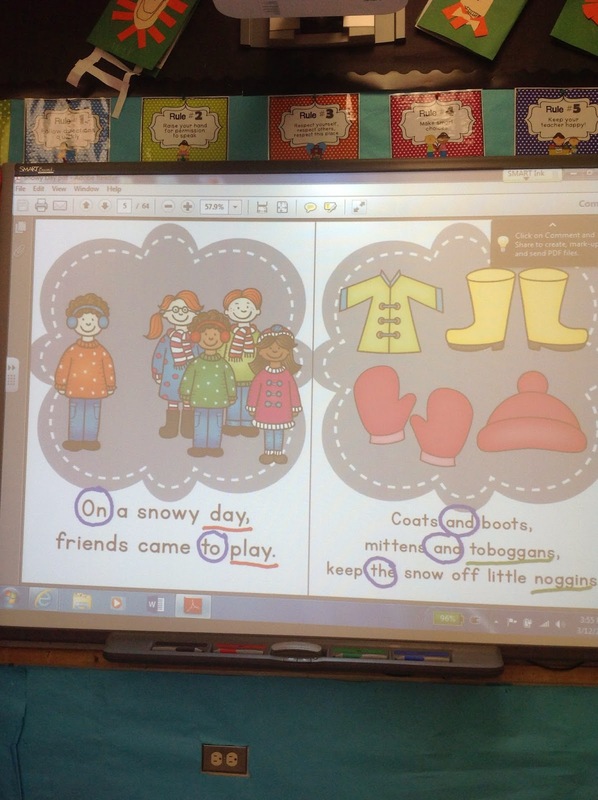 We circle rhyming words and sight words, and then we go back and re-read for fluency. 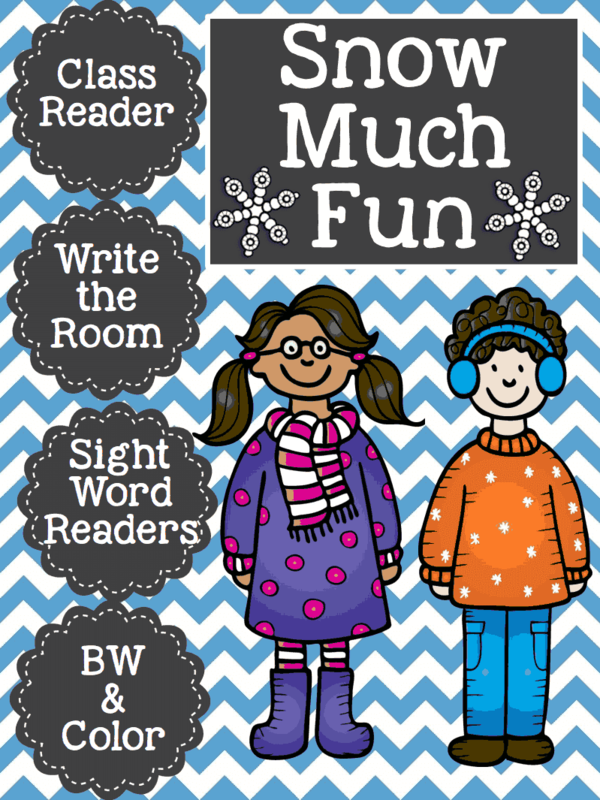 Of course, if you don't have a smart board, you can do these activities on a printed copy of the book. 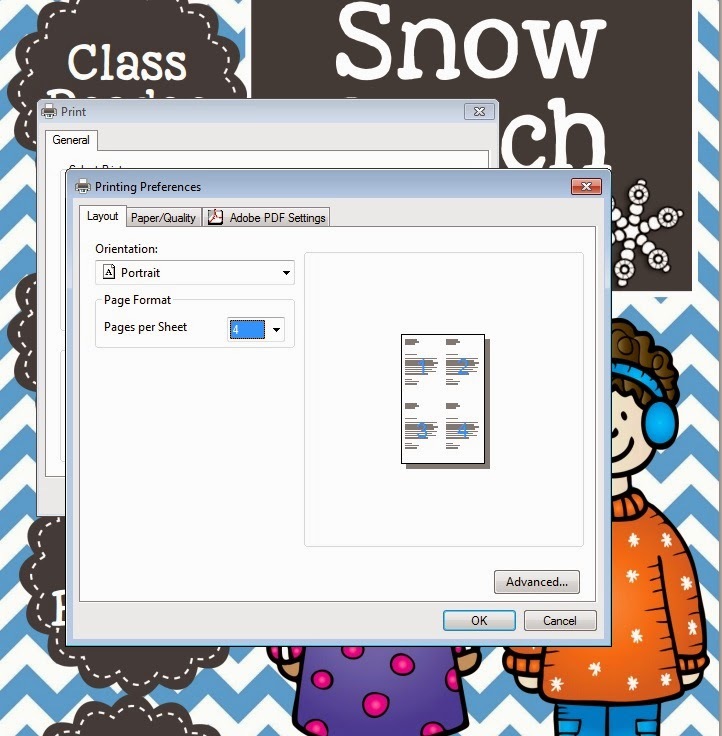 She has provided color and black and white versions of the class reader. I love that! Also in the pack are four emergent readers in black and white. The emergent readers are filled with just-right predictable text, and the font is just perfect for K/1 learners. 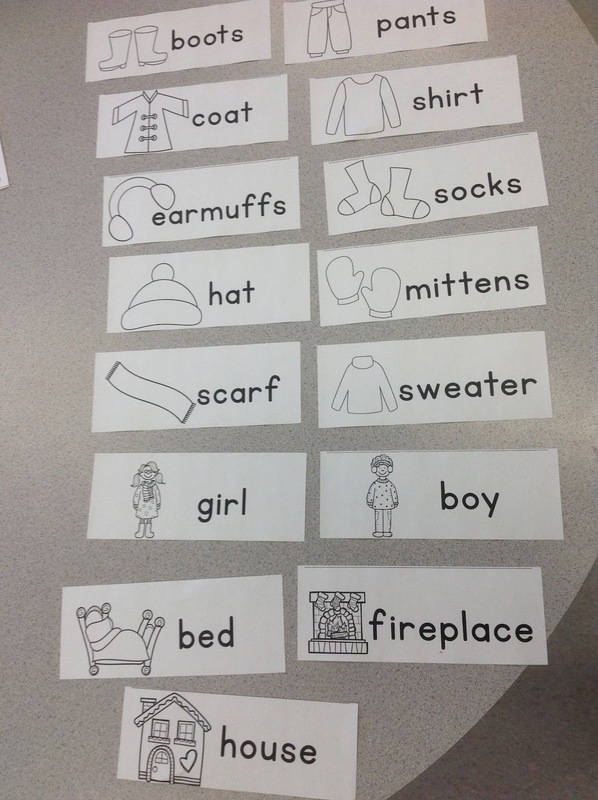 A wonderful addition to the pack is the write the room vocabulary word cards. They are also available in black and white and color versions. To conserve ink, I printed them full-size in black and white. Then I printed them again in color, but I set my printer to print four pages per sheet. 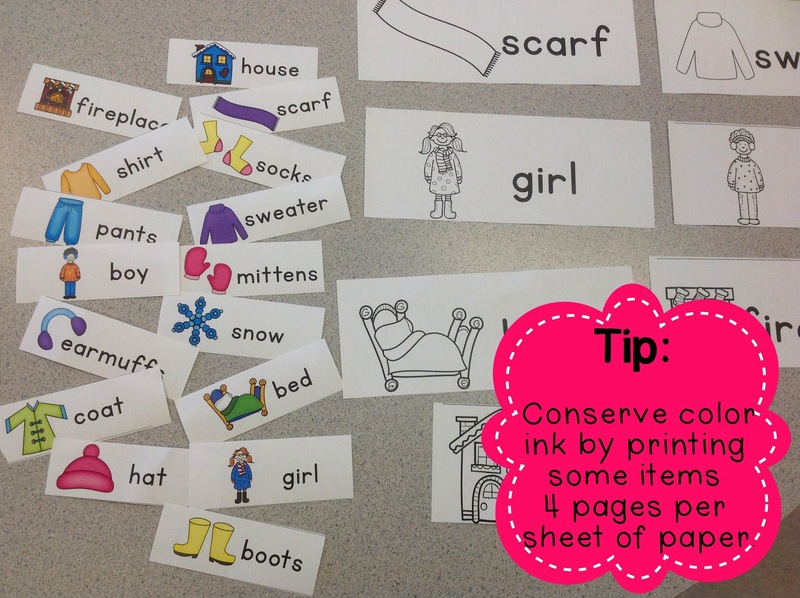 This is a great way of still using color items, but without the ink cost! In the picture below you can see the cards printed both ways. 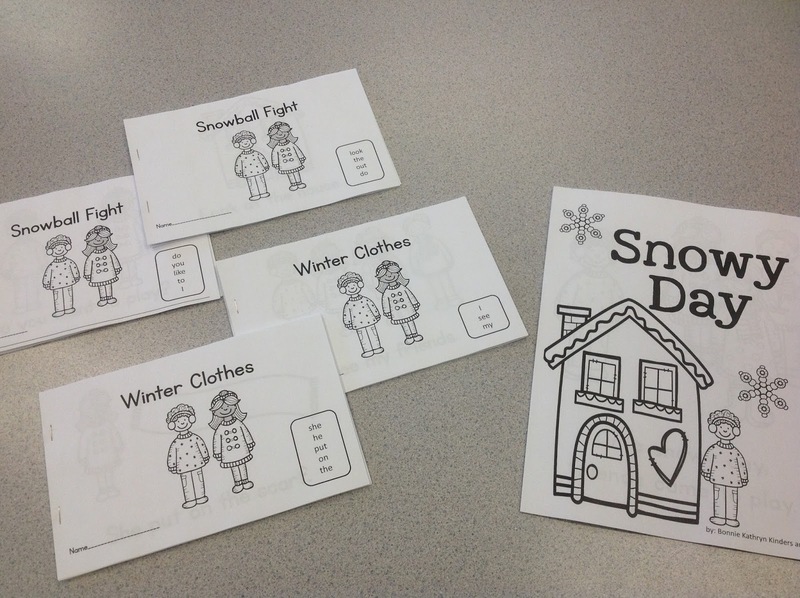 You can use the cards as traditional write the room cards, or you can use them in a pocket chart for practice or for word work. 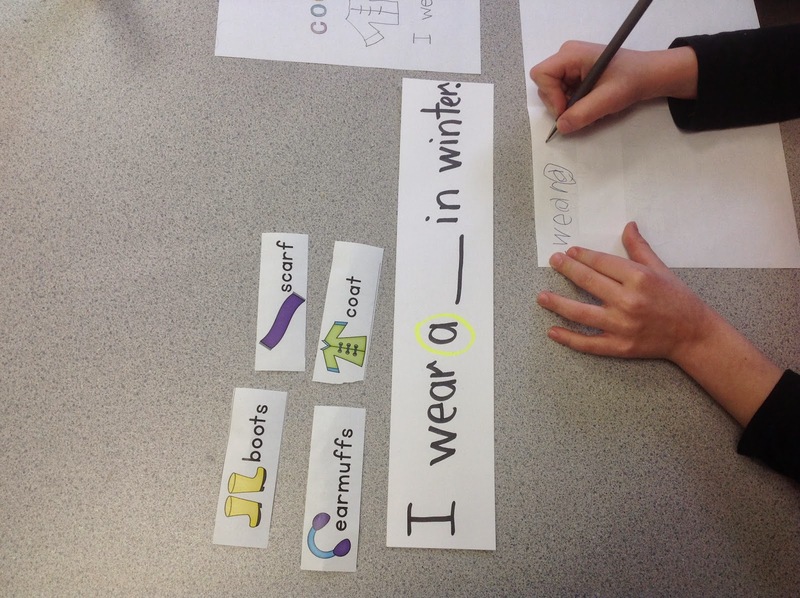 Some of my students need help writing basic sentences, so I created a sentence frame and had the students choose a word to complete the sentence. 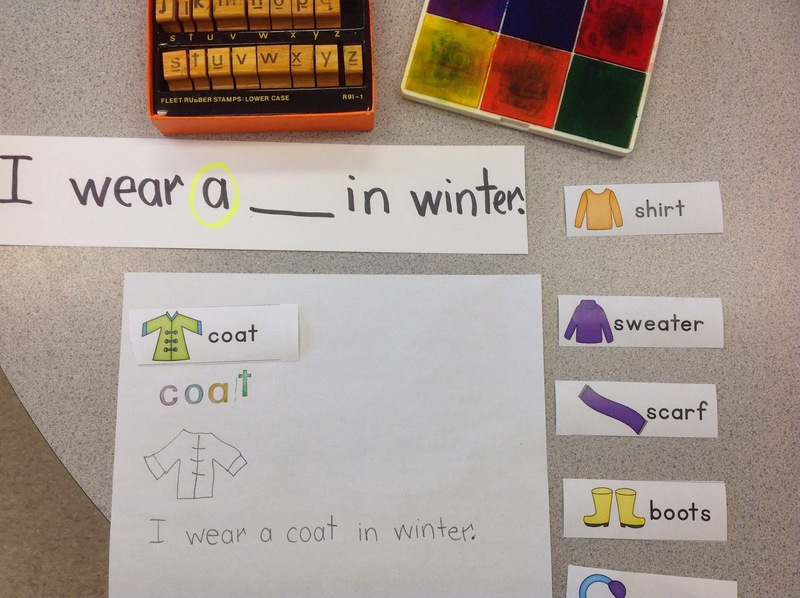 They did word work with chosen word, and then repeated with new words. I highlighted the word "a" in the sentence so that it made it easier to remove for words like "boots" or "pants" which do not require the word "a". 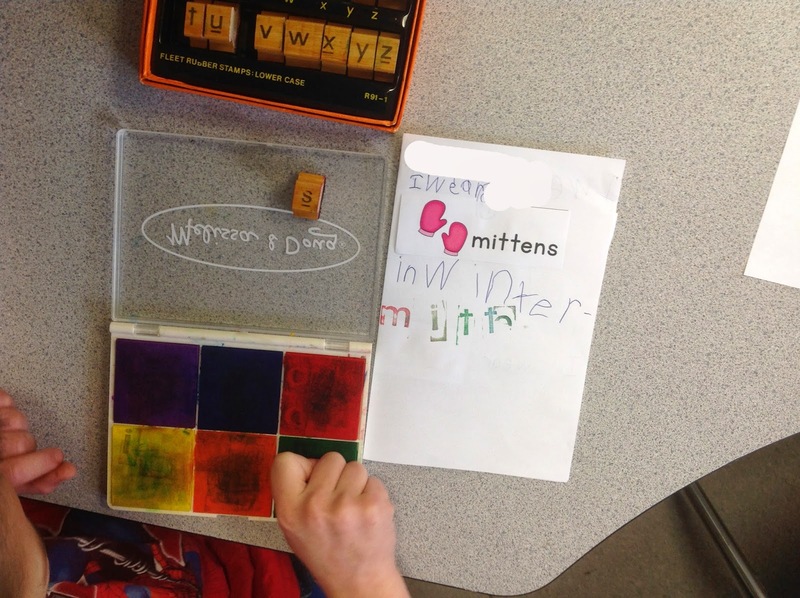 Stamping is always a good way of slowing students down so that they really focus on the spelling of the word. It's also alphabet order practice, since the students need to find the letter stamps in abc order, and return them to their proper space! I encourage you to check out Bonnie Kathryn- Kinders and Beyond on Teachers Pay Teachers. She has many fantastic products, including a shark and whale ELA and Science unit that looks amazing, and is on my wish list. Check out the pin on Pinterest! Thank you so much, Bonnie, for the chance to review your wonderful product.